HOTEL WAIKIKI: If You're Just Dying to Know .... It's, Mercury. If You're Just Dying to Know .... It's, Mercury. I don't know how much the Mercury mission cost NASA to the nearest billion, but I surmise the project was more inspired out of a spirit of, it's the journey not the destination, because obviously Mercury's landscape doesn't offer much in scenery on arrival. 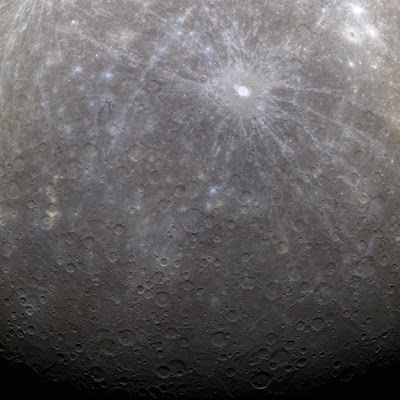 Apparently, Planet Mercury resembles Earth's moon. That we now know with 100% certainty courtesy of the fine folks at NASA. However underneath Mercury surface there might be gold glittering by the heapful and we all could use gold back on Earth. Or a mineral so potent that a bullet size portion of potent material would pack as much wallop as an intercontinental missile armed with multiple nuclear warheads. Wow! It really does look like the moon. Remember, all that glitters is not gold. Kay- my reaction, too. It's moony.